A romantic and historical setting in which to create your perfect day. A unique Grade II listed venue in the heart of the Thames Valley, Lillibrooke Manor has been lovingly restored as a perfect wedding venue providing a fairytale setting for your special day. Wander our stunning grounds and gardens and choose from a variety of beautiful buildings for your ceremony and reception. 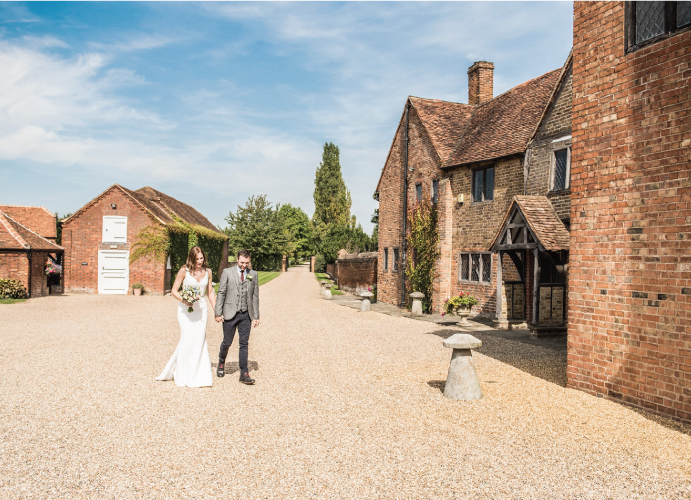 From the country church feel of the Small Barn through to the awe-inspiring Great Barn, Lillibrooke offers a stunning setting and guarantees you beautiful photographs at any time of year. Our experienced events team at Lillibrooke Manor offers exceptional flexibility for you to design your special day around the style that you want to create. Licensed for civil ceremonies, with views to the Manor House and the Great Barn garden. One of the largest Grade II Listed barns in the south of England, the Great Barn is a spectacular space, with the capacity to hold up to 220 people, 170 seated. Generous dance floor and bar areas. State of the art whole barn PA system, HD projector and large screen, adjustable colour lighting and decorative external lighting. The Great Barn garden and forecourt can be used for bouncy castles, lawn games, hay bale seating, hog roasts, BBQs… even fun fair rides! Licensed for civil ceremonies, with views to the Manor House. Linked internally to the Great Barn is the Engine House, a fabulous glazed room with stunning views of the Manor House. An ideal space for up to 80 guests to escape the dance floor and kick off their shoes, sign a guest book, have fun at the photo booth, enjoy an evening buffet, or simply relax with a glass of wine or a coffee. The most popular setting for civil ceremonies, the Small Barn can host up to 120 seated guests. Located in the quadrangle of the pretty cloister garden flanked by other small barns and the covered cloister. A great location for a Welcome Drink Reception. You might like to use this space for children and younger guests to participate in games and organised activities. The cloister is licensed for outdoor civil ceremonies, with the advantage of having the Small Barn as a short notice alternative in bad weather. The garden is the perfect place for a quintessentially English vintage reception. After your ceremony, guests can mingle in the picturesque garden for welcome drinks. The 15th century Manor House provides a beautiful backdrop for your photographs. A spacious area for large group shots, activities or a horse and carriage! The adjoining garden with views across the orchard and neighbouring fields is ideal for a drinks reception and lawn games in the summer. A charming and private room full of character to prepare for the ceremony and throughout your time at Lillibrooke. Lillibrooke’s 15 acres offer open paddocks and fields either side of the main drive and behind the Manor House. Ideal for fun activities and romantic photographs.